The soundtrack opens with a score piece by Hans Zimmer – ‘New York City Surprise.’ It is very much in tune with the other Madagascar soundtracks, which he also worked on, and incorporates some of the familiar music that we now relate to the movies and characters, while giving a new take on them as well. I just really like how this track sets the tone as it plays off of the themes from the previous films. While some may argue that isn’t the most original way to go, I find that for a series like this it’s exactly what you want. After this, we move into the first of many songs on this fun 38 minute soundtrack, that often has a light party feel to it. I’m not going to go indepth about all of the songs, but from Katy Perry’s ‘Firework’ (used over a very cool sequence in the film) to ‘Cool Jerk’ performed The Capitols (which is alternated out on some versions of the soundtrack for Yolanda Be Cool’s ‘We No Speak Americano’), we get a nice mix of songs, that surprisingly all work on the same album. This is a soundtrack that ranges from the expected, to the kind of ridiculous. One such occurrence is Frances McDormand’s cover of ‘Non Je Ne Regrette Rien’, which played during a pretty silly scene in the film anyways. But other things I found really worked, such as ‘Love Always Comes as a Surprise’, which played over a montage that was quite funny and sweet. This song, co-written by Peter Asher and Dave Stewart, and sung by Peter Asher, is the only full original song for this film on the soundtrack, and it really works. This song is worth a listen – definitely give it a chance, and be sure to listen to the words. One other piece that I really like on the soundtrack, is Zimmer’s ‘Light The Hoop On Fire!’ score. It is one of the moments in the score where we get a theme for one of the new characters in this film, while retaining hints of the other Madagascar music. Often other pieces are incorporated into the scores, such as in ‘Fur Power!’, which is really an excerpt from ‘Pomp and Circumstance’ that transitions into the Madagascar theme. One quieter moment on the score is the opening of ‘Rescue Stefano’ – another Zimmer score, which has a slower take on the main theme, before moving into a sort of suite of the different themes from the film. The soundtrack finishes out with a mash-up of the new ‘Afro Circus’ song with the old ‘I Like to Move It’ – now famous (or maybe infamous?) from the Madagascar films. The alternation between a couple songs, followed by one to two scores makes the soundtrack an easy upbeat mix to listen to on a road trip, or at home. It’s a good one for the car, since there aren’t really too many huge variations in sound that will make you keep on reaching for the speakers. There’s no doubt – this soundtrack is all in good fun and makes for a quite enjoyable ride. What are the highlights on the CD for me? For the scores, ‘New York City Surprise,’ ‘Light the Hoop on Fire,’ and ‘Rescue Stefano.’ And in terms of songs, I like ‘Cool Jerk’, the original ‘Love Always Come as a Surprise’, ‘Firework’, and yes, the final track. 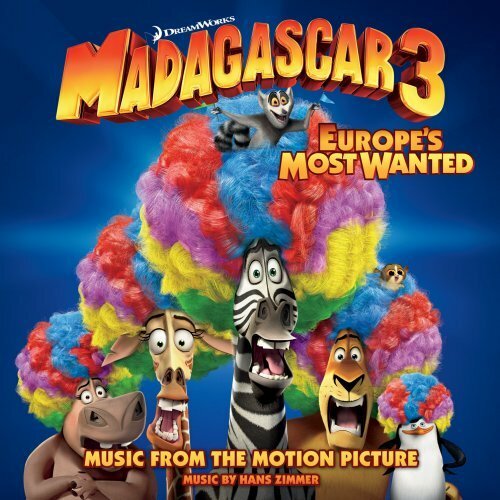 The physical copy of the soundtrack for Madagascar 3: Europe’s Most Wanted, includes a booklet with pictures from the film, a song list, and credits. The disc itself is blue with the Madagascar 3 logo at the top in white lettering. The soundtrack for Madagascar 3 was released by Universal Music Canada on June 5th, 2012. The soundtrack has 13 tracks and runs for 38 minutes, 40 seconds. The CD features original score tracks composed by Hans Zimmer, as well as songs by various artists, including one original track written for the film by Peter Asher and Dave Stewart (Love Always Comes as a Surprise). You can read our full theatrical reviews of the film here. Thanks to Universal Music Canada, we have a copy of the soundtrack for Madagascar 3: Europe’s Most Wanted to give away to one lucky winner through a random draw. For full contest details, please see here!